This title was chosen for its high standard of quality and amazingly positive reviews from our Game Club beta testers. The Theater of Emotions has earned quite the reputation. It’s known all over France for its menagerie of life-like puppets, but it’s also notorious for all the reporters who have vanished trying to reveal its magical secrets. When your best friend, star reporter Enrique Torres, infiltrates the town to get the scoop of the century, he discovers the truth… only to vanish just as mysteriously as all the others. Now it’s up to you to find him! Just watch your back… You don’t know who you can trust anymore. Will this become the big story that makes your journalistic career? Or will it become your final assignment? Find out in this thrilling Hidden Object Puzzle Adventure game! See what our Beta testers had to say:“Beautiful graphics, incredible story line, chilling music, attention grabbing from the start.” - Emma, Beta Tester“Wow, this is an awesome sequel to the series of PuppetShow. 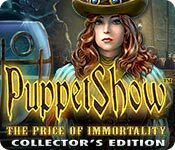 If you like PuppetShow: The Price of Immortality Collector's Edition game, click to start PuppetShow: The Price of Immortality Collector's Edition download.